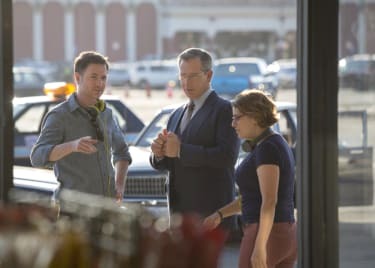 AMC learned a lot about CAPTAIN MARVEL from our on-set visit — which you can read all about on the AMC Scene — but there are still two major questions that need to be addressed, especially because the film guides the overall MCU story directly into April’s AVENGERS: ENDGAME. Let’s start with the most obvious one. Officially, Captain Marvel (Brie Larson) was referenced at the very end of 2018’s AVENGERS: INFINITY WAR. In the post-credits scene, as he faded to dust, Nick Fury (Samuel L. Jackson) used a pager device to summon assistance. The logo that showed up on screen belonged to Captain Marvel, setting the stage for the new solo origin story adventure. So, where the heck has she been all of this time? Why didn’t Nick Fury call for Captain Marvel, aka Carol Danvers, when aliens were attacking Manhattan in THE AVENGERS? Or when Ultron was lifting an entire nation and threatening to drop it back on the surface of the Earth in AVENGERS: AGE OF ULTRON? As we learn in CAPTAIN MARVEL, Carol Danvers was a former Air Force pilot who now fights at the side of the Kree, a militaristic race of aliens who police the galaxies. Throughout the film, she learns of her Earth-based past and that she’s half human. Does she decide to stay in space anyway? Or does she get trapped somewhere, possibly in the Quantum Realm (as referenced in ANT-MAN AND THE WASP) or in one of the Infinity Stones, like Gamora (AVENGERS: INFINITY WAR)? After all, CAPTAIN MARVEL takes place before any other film in the current MCU timeline; she should be aware of everything that happens next (or rather, what has already happened). This raises yet another important question. Why Is Captain Marvel Set in the 1990s? There have been flashbacks in the Marvel Cinematic Universe. We’ve seen young Hank Pym (Michael Douglas) and the early days of the Winter Soldier (Sebastian Stan). But not since CAPTAIN AMERICA: THE FIRST AVENGER has an entire movie been set in an earlier period in the MCU timeline. So, why is CAPTAIN MARVEL set in the 1990s? Setting the film before GUARDIANS OF THE GALAXY allows co-directors Anna Boden and Ryan Fleck to use existing characters like Ronan (Lee Pace) and Korath (Djimon Hounsou). And Marvel Studios President Kevin Feige has talked about how he likes tapping into the nostalgic motif of the 1990s. See the Blockbuster Video as a location and Carol wearing a Nine Inch Nails T-shirt as examples. But there’s a fun theory that there’s a bigger reason for setting CAPTAIN MARVEL in a time before Nick Fury recruited Tony Stark to help him form the Avengers. 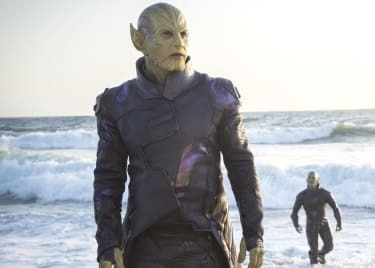 There’s a popular Marvel Comics storyline called “Secret Invasion.” And in it, the Skrulls — the shape-shifting villains introduced in CAPTAIN MARVEL — replace recognizable Marvel superheroes. 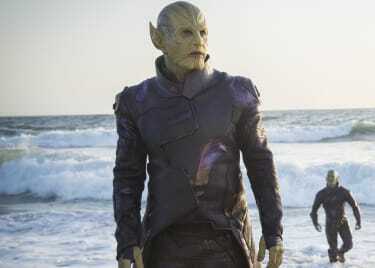 Numerous heroes were revealed to be Skrulls in disguise. While that’s not a plot point of CAPTAIN MARVEL, what if the film sets the stage for a future MCU movie? What if it’s revealed that some major character who we have followed in the MCU for years has actually been a Skrull, hiding in plain sight? It could be someone like General Thaddeus E. “Thunderbolt” Ross (William Hurt). It could even be someone as important as Hawkeye (Jeremy Renner). This would explain the significance of placing CAPTAIN MARVEL ahead of the formation of the Avengers as a super team, because it would change how we view everything that has happened in the MCU to date and set the story on a dangerous course for future movies. 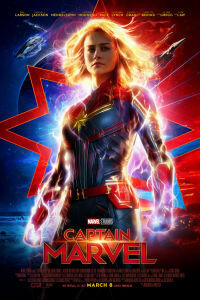 Find out the answers to your big questions when you see CAPTAIN MARVEL at AMC.